In what environmentalists are calling a major victory for pipeline opponents and the planet, TransCanada announced Thursday that it is abandoning its Energy East pipeline project, which would have carried over a million barrels of crude oil across Canada per day. Oil Change International (OCI) estimated in an analysis earlier this year that Energy East would produce an additional 236 million tons of carbon pollution each year. For this reason and many others, OCI applauded TransCanada’s decision to nix the project, which was first proposed in 2013. Aurore Fauret, Tar Sands Campaign coordinator at 350.org, echoed Scott’s celebration and highlighted the grassroots mobilization that brought the pipeline into public view and ultimately helped ensure its defeat. TransCanada also announced Thursday that it is ditching the Eastern Mainline pipeline project in the face of critical scrutiny from Canadian energy regulators. Both projects from their inception faced fierce opposition from Indigenous groups and climate activists, who often referred to Energy East as a “ticking time bomb” that posed a tremendous threat to sacred lands and the water supply. “It simply is not worth the risk,” Maude Barlow, honorary chairperson with the Council of Canadians, concluded in 2014. 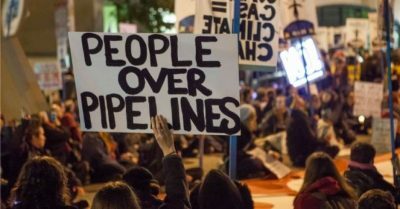 But while the downfall of both Energy East and Eastern Mainline was welcomed by those who worked tirelessly for years to guarantee their defeat, activists issued an urgent reminder that the fight against pipelines in both Canada and the United States has only just begun.